How to write your own attribute directive in Angular? In the last post, we saw how to use structural directives like *ngIf and *ngFor that can be used to modify DOM elements. Attribute directives can change the appearance or behavior of an element, component, or another directive. In this post, I am going to show you how to write your own attribute directives in Angular. For this, we are going to create a directive which on single click will enlarge our text and on double click get it back to original size. We will see this in action in some time. 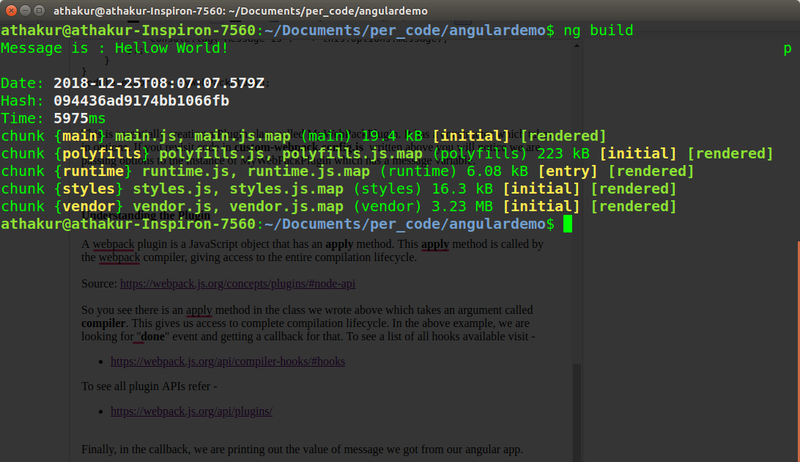 Next, we have a constructor where we have access to the native element and the renderer. We can use APIs from renderer or Native element to actually make changes to the element. Go to http://localhost:4200/ and see your changes. Single click on the text to enlarge it and double click it to bring it to its original size. This is not a great example with perfect CSS and animation but I hope this gives you an idea of how you can write custom directives in angular. These are very powerful techniques to change the appearance of your components. Let me know if you have any questions. Thanks. This is the last post of the year 2018 :). So wishing all a very happy new year! Hoping coming year would be more awesome with a lot of more learning and sharing! We have already seen how to create components, how components interact with each other. Structural Directives change the structure of the view whereas Attribute directives are used as attributes of elements. You can use build in directives provide by angular or build your own. In this post, I will explain structural directives such as *ngIf and *ngFor. As mentioned before structural directives manipulate the DOM structure by adding or removing elements from the DOM. An asterisk (*) precedes the directive attribute name. Let's see an example by using *mgIf. This structural directive is used to decide if the element on which it is applied (including its children) are added in DOM or not. Notice how the h1 elements take part of DOM and when it is not visible it gets removed. Your button position will get adjusted based on that. NOTE: When the condition is false, NgIf removes its host element from the DOM, detaches it from DOM events (the attachments that it made), detaches the component from Angular change detection, and destroys it. The component and DOM nodes can be garbage-collected and free up memory. The asterisk is "syntactic sugar" for something a bit more complicated. Internally, Angular translates the *ngIf attribute into a <ng-template> element, wrapped around the host element. Now let's take a look at *ngFor directive. Change the component code to have an array of cities. NOTE: Angular desugars this notation into a marked-up <ng-template> that surrounds the host element and its descendants. Each structural directive does something different with that template. How to dynamically create a component in Angular? 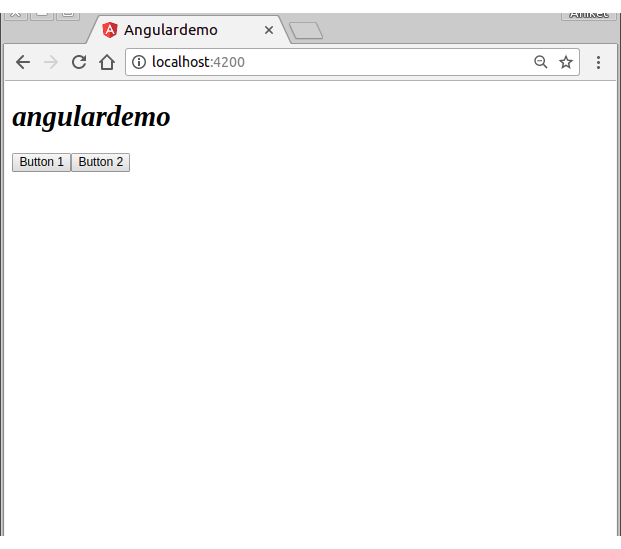 In the last few posts, we have been seeing how to write applications in Angular. If you wish to revisit some of them take a look at the Related Links section at the bottom of this post. In this post, I will show you how to dynamically create components on Angular. I am assuming you already have the boilerplate code we have written so far. This would be an extension to it. It is a simple HTML content. Let me explain this first. We have a simple h1 tag which has a bound value called title. title value would be provided by the corresponding component definition in the typescript file. We will come to the changes in typescript file in a moment. Next, we have 2 buttons that call the function genComponent on the click event. This function definition would again go in the typescript file which we will see shortly. Lastly, we have a template tag where we will dynamically load our component. This new component as we will see has a bound value called msg which is what you see as the argument of genComponent function. As you can see this ChildComponent which we intend to create dynamically take an argument msg as input. We will see how we can pass this input when we dynamically create this. You can also see it's HTML content - It simply has an H2 tag with the bound msg input. We already say the content of app.component.html above where we removed the navigator outlet and added 2 buttons and a template for dynamically loading our CHildComponent. Inside the component definition, we have a variable called title which we say in the HTML template inside h1 tag. Then we have an entry variable which points to the template tag we have created in AppCpmponents HTML file. 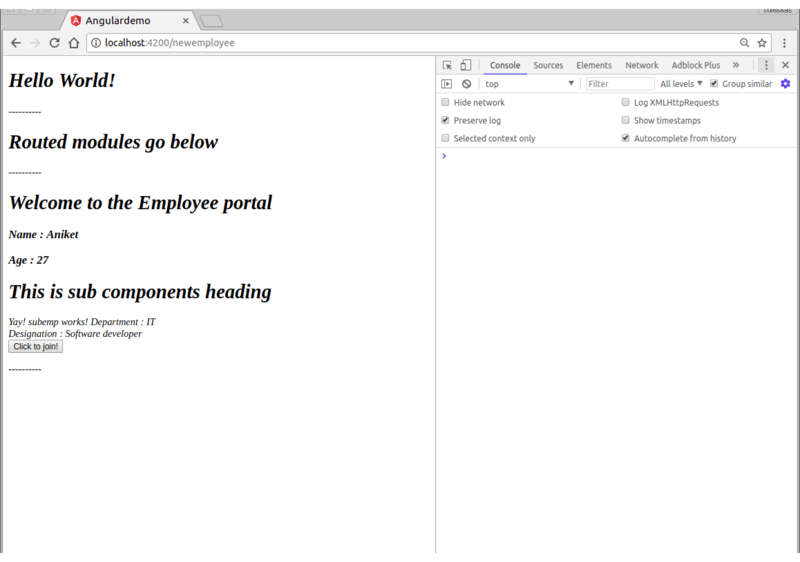 We can access template as the ViewChild inside the Component class. The template is a container in which, we want to load the ChildComponent dynamically. Therefore, we have to access template as ViewConatinerRef.ViewContainerRef represents container where one or more view can be attached. Next, we have defined a constructor where we have injected ComponentFactoryResolver dependency. We need this to create the component dynamically. Then we have 2 methods - genComponent and destroyComponent that is used to create and destroy our ChildComponent dynamically. Notice how we are storing the reference of the new component in componentRef and using it. Also, notice we are calling destroyComponent in ngOnDestroy lifecycle hook of angular component. You could add this login inside an event of your own as well. You also saw how our ChildComponent has an input called msg and you can see in genComponent function we are passing this input as this.componentRef.instance.msg. Also, take care of all the imports that are on the 1st line of the above code. NOTE: The entry component which is a reference to the template tag has APIs to create and destroy components. How to write your own webpack plugin? 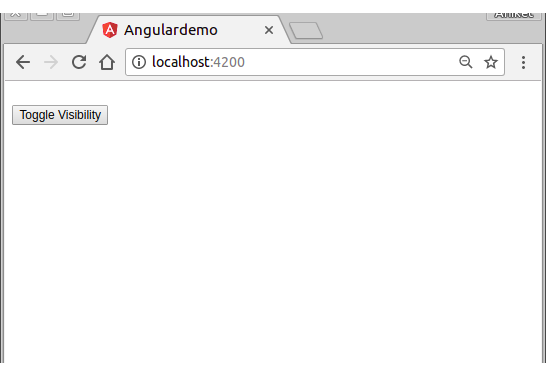 we saw how we can customize webpack build configuration without using "ng build" command with angular CLI 6. 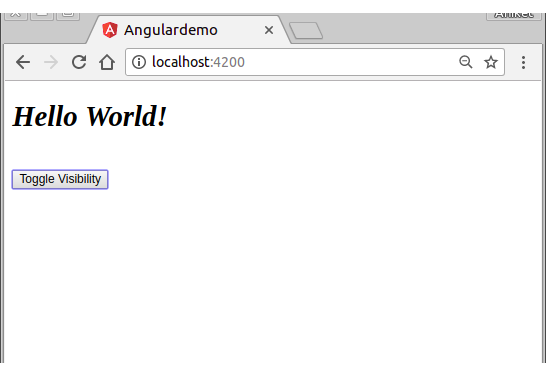 In this post, I will show you how we can build our webpack plugin and use it in our angular project. 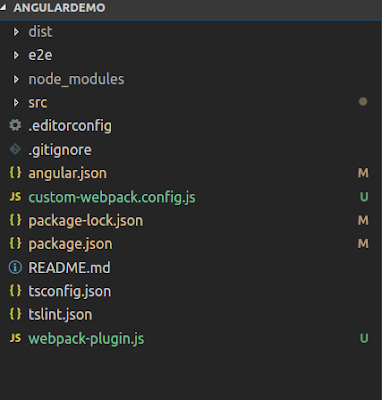 As you can see it tells webpack that it needs to use a custom webpack plugin supplied. Also if you remember from last post configurations in this file are merged with the default ones. So no need to provide all webpack configurations in this file. Just the ones to add/edit should suffice. In the above code, we are saying we need a plugin wrote in a separate file called ./webpack-plugin.js. Once we import it we create an instance of the plugin class and pass a variable called message to it. We will see this plugin class in a moment. So whenever webpack runs it will use this plugin. For the actual plugin code create a file called custom-webpack.config.js in the same folder as webpack-plugin.js and add the following code to it. This is essentially creating a Plugin class called MyWebPackPlugin. It has a constructor which takes in options. If you revisit code in custom-webpack.config.js written above you will notice we are passing options to the instance of MyWebPackPlugin which has a message variable. Finally, in the callback, we are printing out the value of message we got from our angular app. NOTE: We are using webpack 4. Plugin code would look slightly different for webpack 3. Let's run ng build and see if our changes worked! And you can see our message getting printed in the console. In Angular CLI 1.x (Angular 5) we had a command called "ng eject" which ejected underlying webpack configuration so that you could make changes based on your requirements. This has been disabled with Angular CLI 6. 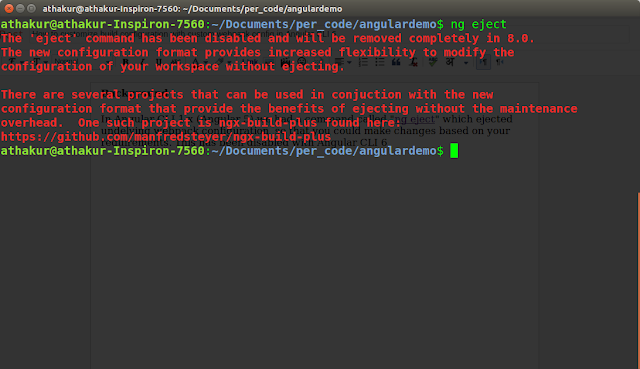 As you can see it will be completely removed in Angular CLI 8.0 version. In this post, I will show you how you can customize your builds with custom webpack configuration without using ng eject. 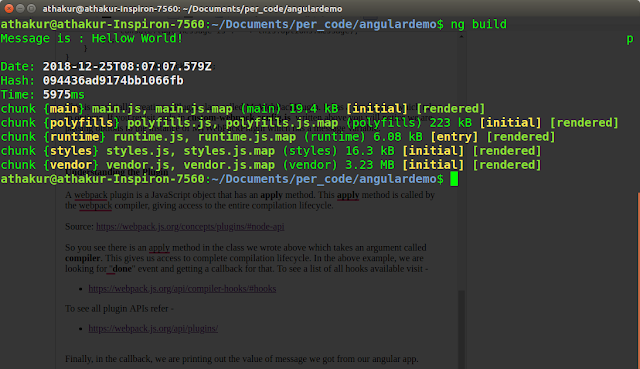 For this, we will use a library called angular-builders. This post assumes you have done necessary setup and have basic knowledge of Angular 6. I have written multiple posts previously on these. If you are not following it then take a look at the links in the related section at the end of this post. This uses the concept of Builders. You can provide a builder of your own or can use one that is provided by the community. This should install the required additional dependencies in the node_modules folder in the same directory. 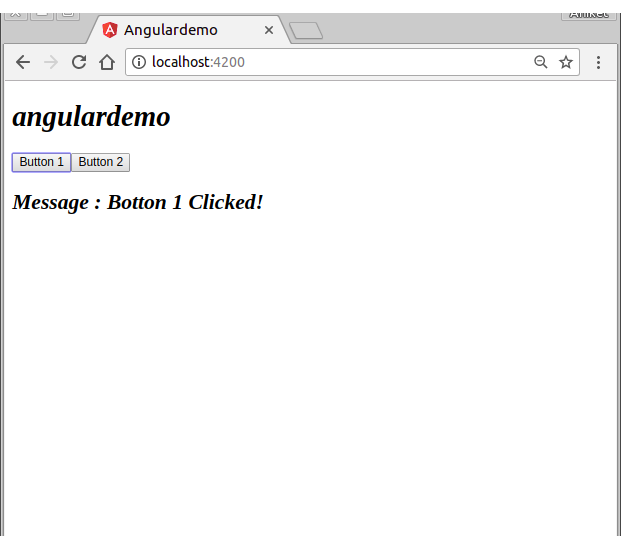 Now go to angular.json file. 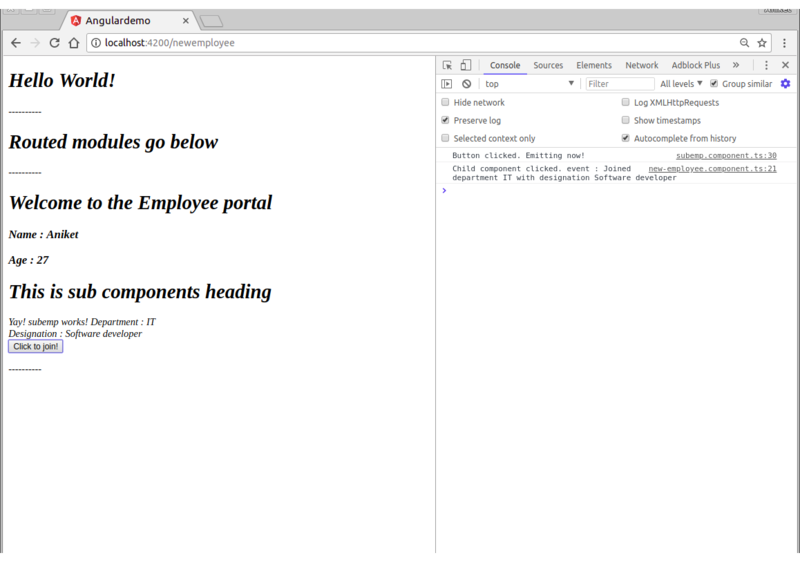 Here you need to change the builder from "@angular-devkit/build-angular:browser" to "@angular-builders/custom-webpack:browser". NOTE: If you are building an universal app and would like to change server build configuration use @angular-builders/custom-webpack:server instead of @angular-builders/custom-webpack:browser. Next, you need to add customWebpackConfig property to your build target options to point it to your custom webback config file. Now you can create a file called custom-webpack.config.js in the root directory (Same place where the angular.json file exists). NOTE: Unlike ng eject command this configuration will be merged with default angular build configuration. So you need to add configuration to this file which you wish to change/add (and not the whole thing). How to use ng serve with custom webpack configuration we set up above? 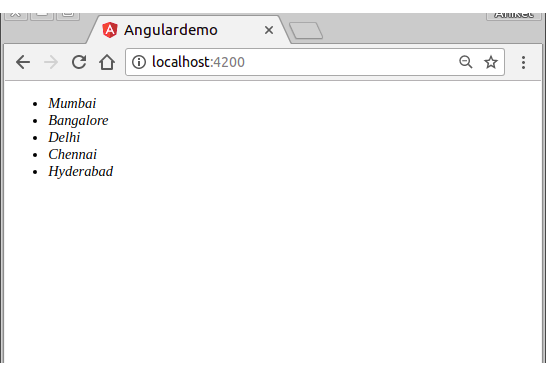 Inside serve target in angular.json file change "builder": "@angular-devkit/build-angular:dev-server" to "builder": "@angular-builders/dev-server:generic". Now you can do an ng serve and custom webpack configuration changes we did will be used.